Made from solid brass with durable chrome finish, our radiator valves compliments stylish towel rails and radiators. And our angled valves are suitable for wall pipe work--if your pipe work is emerging from the wall you will require angled radiator valves while if you are connecting your radiator to pipe work running along the floor you will need straight radiator valves. High quality solid brass construction with chrome finish. Max working pressure 13 bars. Comply with all UK regulations and British Standards. 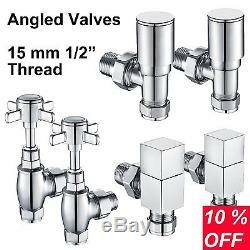 Designer Central Heating Radiator Valves Angled Manual Brass Chrome 15 mm ½ UK. Size: water pipe connections 15 mm compression; connects to 1/2 inch BSP radiator/heated towel rail. Package: 2 x on/off valves in one package. Our business is built on offering great products, at great prices, with great service. Our aim is simple - to delight our customers so they come back for more. We hold stock at our warehouse in United Kingdom and we aim to dispatch all orders within 1 day. House Contemporary Radiator Anthracite Upright Single Column Central Heating UK. White Upright Designer Bedroom Kitchen Radiator 4 Single Columns 1800 x 240 mm. New Horizontal Living Room Radiator Double Column 600 x 1200 mm Central Heating. Anthracite New Designer Slimline Radiator Single Column Panel Central Heating UK. Ladder Flat Heated Towel Bar Bathroom Chrome Square Steel 800 x 600 Wall Mounted. The item "Designer Central Heating Radiator Valves Angled Manual Brass Chrome 15 mm ½ UK" is in sale since Tuesday, July 05, 2016. This item is in the category "Home, Furniture & DIY\Heating, Cooling & Air\Radiators". The seller is "britain_radiators" and is located in UK.